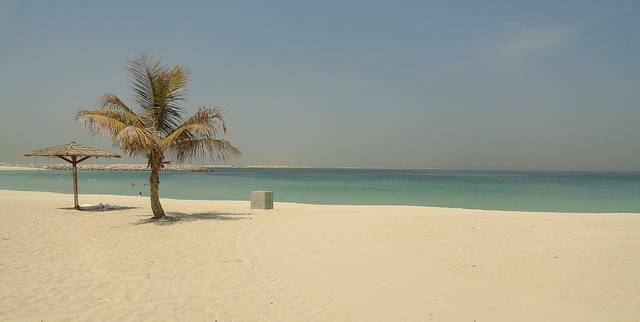 Al Mamzar Beach Park is located in the Deira area, sharing its borders with the Emirates Sharjah. It is another enjoyable place in Dubai where ample accommodations are present along the beach. The beach park is a massive area comprising of a chain of four beautiful beaches and acres of land clothed in greenery with palm trees and shady trees standing on it and pavements on the shores of the sea. A swimming pool, water sports, basketball courts, playground for children are all provided. Private chalets and air conditioned cabanas also add to the list of facilities and luxuries. The only drawback is the scarcity of food stalls on the beaches. Al Mamzar Beach Park is around 7 kilometers from the Rashidiya metro station and is well accessible. So book your weekends with this fun filled amusement park and lounge on the sea beds comforting yourself with rented chairs and umbrellas. Go give yourself some experience of marine life by snorkeling.